Today, we humble souls here at NECA HQ are continuing our proud tradition of bringing your favorite games to life. 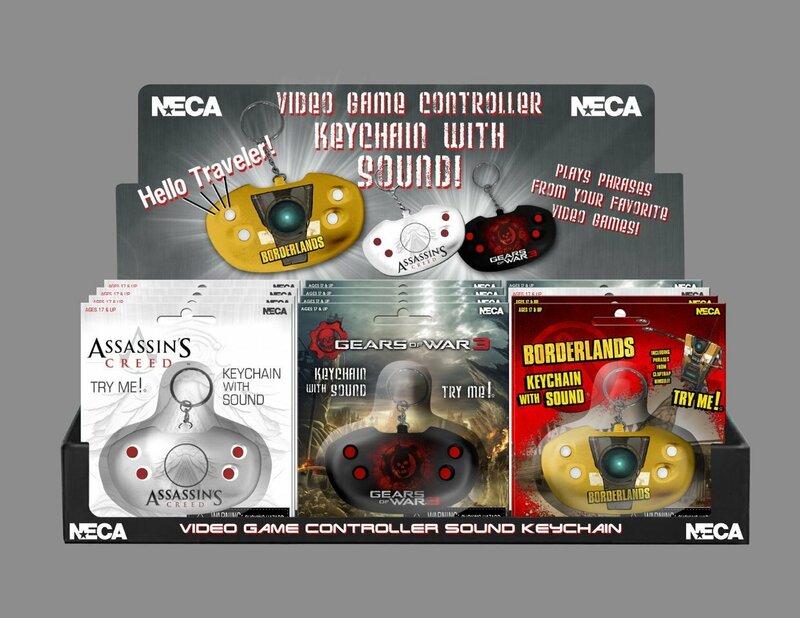 As always — thanks in part to a generous helping of coffee and sugary whathaveyous — we’re excited to show off these all-new video game controller talking keychains for Borderlands, Assassin’s Creed and Gears of War! As you can see in the pic above, they come 12 to a box (48 pieces per case), and each keychain has four unique phrases from its signature game. Maybe you saw these bad boys at NYC Toy Fair 2012. They were right there at our booth — along with a ton of other great upcoming NECA items for this year — and if you were there, you already know the keychains are designed to look like video game controllers and are about as close as you’re ever going to get to actually taking the ClapTrap robot from Borderlands with you (though the Borderlands action figures also come close) or having orders barked at your COG self by the cast of Gears of War. We all know what it’s like to lose your keys, but it’s a pretty safe bet that with Ezio Auditore (whose brand new Onyx Costume figure we posted about just the other day) from Assassin’s Creed serving as a reminder, you’ll never let them go again. Look, this one’s kind of a no-brainer, folks. You love games, you’ve got keys, we love the same games and we’ve got talking keychains to prove it. Not sure what you’re waiting for here. Each controller keychain features a design unique to the game it’s based on and four phrases taken directly from the game. They’re available now through your favorite retailer. Keep it tuned to your friendly neighborhood NECA for updates on Borderlands, Gears of War, Assassin’s Creed — and their entire legion of offshoots and sequels — as well as all your other favorite games, movies and more!